I wouldn't normally plan a border this early on in the quilt – I'd prefer the top was finished to lay it against different fabrics and see what looks best. I don't think we've got time for that here, as most of the fabrics have to come from overseas. I've mucked around with a few options – see below. The stripe shown is in a green colour-way. It also comes in yellow or blue. We could also substitute the stripe, where it's used as a narrow strip, with short lengths of all the fabrics sewn together. My vote, though goes to the bottom left or right. I think the small cream border with the larger solid green or blue is cleaner. I was thinking of the blue or green leaf pattern, rather than a solid blue or green. What is everyone else's favourite? Any other ideas are welcome too! 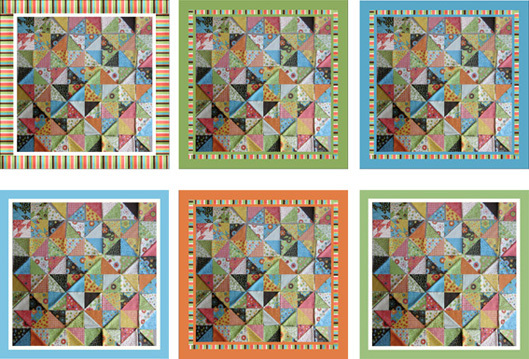 My favourite is definitely the striped border - but love all of them. I think they all look pretty good but agree that that cream and plain combo are "cleaner" finishes. However, my favourite is probably the middle top one - with the option to use short cuts of fabric used. However, Zoe thinks the top right is the best :) But of course happy to leave the final descision up tp you TJ. Livy is well. We are all back at home after a very long and tiring 4 days. I was so inspired by all the amazing people at the children's hospital while at the same time feeling heartbroken for the sick kids! It is an incredible place. Basically was feeling very lucky that Livy wasn't actually sick! Um and about that business. I think Tara would be doing all the work making and we would have to pretty quickly find other ways to keep busy haha.